Metallurgy is the science and technology of metals, concerned with their extraction from ores, the methods of refining, purifying, and preparing them for use and the study of the structure and physical properties of metals and alloys. A few unreactive metals such as silver and gold are found native (uncombined), but most metals occur naturally as minerals (i.e., in chemical combination with nonmetallic elements). Ores are mixtures of minerals from which metal extraction is commercially viable. Over 5,000 years man has developed techniques for working ores and forming alloys, but only in the last two centuries have these methods been based on scientific theory. 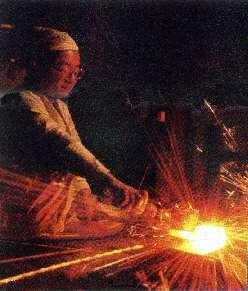 The production of metals from the ores is known as process or extraction metallurgy; fabrication metallurgy concerns the conversion of raw metals into alloys, sheets, wires, etc, while physical metallurgy covers the structure and properties of metals and alloys, including their mechanical working, heat treatment, and testing. Process metallurgy begins with ore dressing, using physical methods such as crushing, grinding, and gravity separation to split up the different minerals in an ore. The next stage involves chemical action to separate the metallic component of the mineral from the unwanted nonmetallic part. The actual method used depends on the chemical nature of the mineral compound (e.g., if it is an oxide or sulfide, its solubility in acids, etc.) and its physical properties. Hydrometallurgy uses chemical reactions in aqueous solutions to extract metal from ore. Electrometallurgy uses electricity for firing a furnace or electrolytically reducing a metallic compound to a metal. Pyrometallurgy covers roasting, smelting, and other high-temperature chemical reactions. It has the advantage of involving fast reactions and giving a molten or gaseous product which can easily be separated out. The extracted metal may need further refining or purifying; electrometallurgy and pyrometallurgy are again used at this stage. Molten metal may then simply be cast by pouring into a mold, giving, e.g., pig iron, or it may be formed into ingots which are then hot or cold worked, as with, e.g., wrought iron. Mechanical working, in the form of rolling, pressing, or forging, improves the final structure and properties of most metals, it tends to break down and redistribute the impurities formed when a large mass of molten metal solidifies. Simple heat treatment such as annealing also tends to remove some of the inherent brittleness of cast metals. Electrometallurgy is the application of electrochemistry to metallurgy. It includes the production and refining of metals by electrolysis and such techniques as electroplating, electrolytic machining and polishing, and electroforming. In a wider sense, electrometallurgy includes other uses of electric current, as in alloy steel production using an electric furnace.